You are browsing the archive for 2017 December 27. The biggest night of the year was quickly approaching, and Adolph S. Ochs needed to find new entertainment for his New Year’s Eve party. For the previous three years, the New York Times publisher had set the skies above Manhattan ablaze with a midnight fireworks show launched from the roof of his newspaper’s 25-story headquarters. 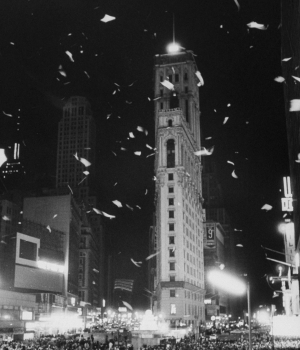 The pyrotechnics had been a hit with the 200,000 revelers who filled the junction around Broadway and 42nd Street—newly rechristened Times Square after its famous tenant—but the hot ash that rained down upon them concerned New York City officials so much that they banned the fireworks from ushering in 1908. Ochs wasn’t one to be easily deterred. His flashy New Year’s Eve bash had previously drawn crowds away from the traditional celebration in Lower Manhattan, where New Yorkers listened as the bells of Trinity Church rang in the new year. Yet without the fireworks show, Ochs would need a new spectacle to lure the masses to the hinterlands of Times Square for New Year’s Eve. The New York Times chief found the inspiration he needed at the Western Union Building downtown, where a metal ball three-and-a-half feet in diameter dropped from the pinnacle of the building to signify the time every weekday at noon. Nearby city dwellers peeked their heads out of horse-drawn carriages and windows, craning their necks skyward as the sun reached its zenith. On the rare occasions that the operation malfunctioned, it was the talk of the town and fodder for the newspapers. The New York Times publisher decided to put his own spin on the city’s beloved “time ball” to usher in 1908. As people poured out of theaters, restaurants and streetcars into Times Square on December 31, 1907, they gazed up to the top of the Times Tower and saw a dazzling orb made of wood and iron, illuminated with 100 electric light bulbs. What better way to welcome the new year than with a pint of a good craft brewski? Let's talk about two daily essentials: Breakfast, and of course, beer. Mass marketers of breakfast cereals have been in a downward sales spiral for about a decade, so they're getting back to their roots (sort of). Few folks know that some of the oldest and biggest brands of today's artificially flavored, neon-colored, empty-calorie cereals started out as health foods, often springing from religious or utopian movements. For instance, Ralston Purina's Wheat Chex cereal was first packaged in 1937 under the name of Shredded Ralston, specially formulated for followers of Ralstonism. What was that? A strict, bizarre, racist cult with a demonic mission: To make America a nation of Caucasian purity. Webster Edgerly, the unhinged founder of Ralstonism, proposed an efficient means for achieving his pure-white dream world: Castrate all males of “impure” lineages at birth. The big manufacturers today aren't going full-tilt Ralstonist to reclaim market share, but they are going back to pitching their products as health food, hoping to woo millennials who want cereals with more protein, fiber, and natural ingredients and none of the artificial additives the industry has been dumping into its Choka-Mocha-Salted-Sugar Bombs. Some brands are seeking Good-For-Ya credibility by buying out organic brands such as Kashi (consumed by Kellogg's) and Annie's Homegrown (swallowed by General Mills). But the sweeping shift of this $10-billion market to healthier alternatives is, in fact, an enormous, grassroots victory, driven by the organic movement, groups like Center for Science in the Public Interest, Good Food entrepreneurs, fearless nutritionists and especially by countless moms, dads and kids who simply refused to swallow the industry's crap. He's the worst president we've ever had. Some two hundred forty years later, in the presidential campaign of 2016, candidate Trump was accused of failing to pay his income taxes. His response was “that makes me smart” – thereby signaling to millions of Americans that paying taxes in full is not an obligation of citizenship. Trump also boasted about giving money to politicians so they would do whatever he wanted. “When they call, I give. And you know what, when I need something from them two years later, three years later, I call them. They are there for me.” In other words, it’s perfectly okay for business leaders to pay off politicians, regardless of the effect on our democracy. Trump sent another message by refusing to reveal his tax returns during the campaign or even after he took office, or to put his businesses into a blind trust to avoid conflicts of interest, and by his overt willingness to make money off his presidency by having foreign diplomats stay at his Washington hotel, and promoting his various golf clubs. There are numerous links between the Trump administration and Whitefish, a center of white supremacy. Something fishy is going on in Whitefish, Montana. The small town of 6,500 is in one of America's most rural regions, but it has occupied a lot of media space this year. Since the beginning of 2017, the town’s name has popped up repeatedly in stories about the far right. Whitefish is the home base for Trump’s potential private spy agency, as well as the tiny company contracted to restore power in Puerto Rico, and early in the year, the town drew media attention as the proposed meeting point for an anti-Semitic rally. On the surface, these may not seem related. But on closer examination, all three are clearly linked to the Trump White House. Let's begin with Whitefish Energy. After Hurricane Maria hit Puerto Rico and left the island without power, a tiny company based in Whitefish, operating for less than two years, was contracted to restore power for a hefty fee of $300 million. The Puerto Rican government opposed the Whitefish Energy deal and it ultimately fell through, terminating November 30. The FBI has since launched an investigation into the contract. For nearly 200 years, the Jackson Magnolia has been photobombing pictures of the White House’s south lawn. 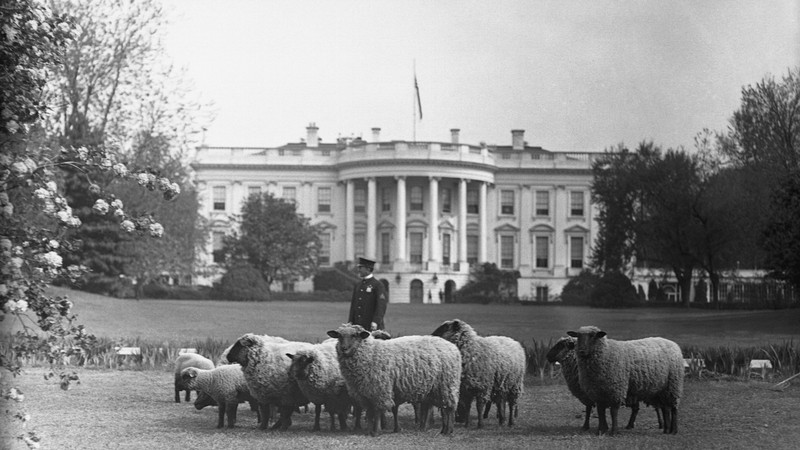 You can see the famous tree in CBS’s coverage of Richard Nixon leaving the office in 1974, pictures from numerous White House Easter Egg Rolls, as well as this photo of Woodrow Wilson’s sheep grazing on the south lawn around 1918. But the Jackson Magnolia isn’t what it used to be. CNN reports that the tree has been declining for decades. Furthermore, efforts to preserve it by holding it up with cables and filling a hole in it with cement haven’t succeeded. Because of this, the White House announced in the waning days of 2017 that it will remove a large portion of the historic tree from the lawn. The Jackson Magnolia gets its name from Andrew Jackson, the president who planted it in 1829, during his first year in office. Magnolias were supposedly the favorite tree of his late wife, Rachel, who died just after he won the 1828 election. In honor of her, he chose a Magnolia grandiflora seedling (or little plant) from their Tennessee farm to bring to the White House. Since then, the Jackson Magnolia has become a recognizable background figure in presidential events and photo shoots. When the U.S. Treasury inexplicably replaced Grover Cleveland with Jackson on the $20 bill in 1928, the Treasury even added an image of the magnolia to the back of the bill, where it remained until 1998. The United States Marine Corps has endured few firefights as savage as the Battle for Outpost Vegas in the waning months of the Korean War. With a roar that sounded like “twenty tornadoes tearing at a countryside,” according to one serviceman, more than 500 mortar and artillery rounds per minute deluged the mountaintop ridge where the Recoilless Rifle Platoon of the 5th Marines attempted to repel a Chinese assault on March 27, 1953. So much ordnance howled overhead that radar screens could only display a giant, useless blur and incoming and outgoing shells collided in mid-flight. As the sky fell on the Marines defending Outpost Vegas—so named because it would be a gamble to hold—they rejoiced as the silhouette of their beloved comrade emerged once again from the shroud of smoke that cloaked their position. All day long, their fellow Marine had traversed the “smoking, death-pocked rubble” to deliver fresh ammunition along with a badly needed boost of morale. Traveling alone on 51 rounds trips through a no-man’s land of rice paddies and scaling a 45-degree incline with bowed head and quivering legs, the solitary figure fought the natural instinct to flee and relied on training and fortitude to deliver nearly 9,000 back-breaking pounds of ammunition from the supply point to the gun teams. The platoon knew their heroic compatriot was no ordinary Marine—and it wasn’t just because she was a horse. A calming presence amid the chaos erupting around Outpost Vegas, the mighty mare named “Reckless” lugged six rounds, then eight, at a time up the mountain and evacuated wounded Marines back down the slope for medical treatment—even after sustaining two shrapnel wounds that would earn her a pair of Purple Hearts. On one trip, Reckless even donned flak jackets and shielded four Marines up the mountain. “Horses are flight animals, but Reckless ran toward the danger because she knew the guys needed her,” says Robin Hutton, author of Sgt. 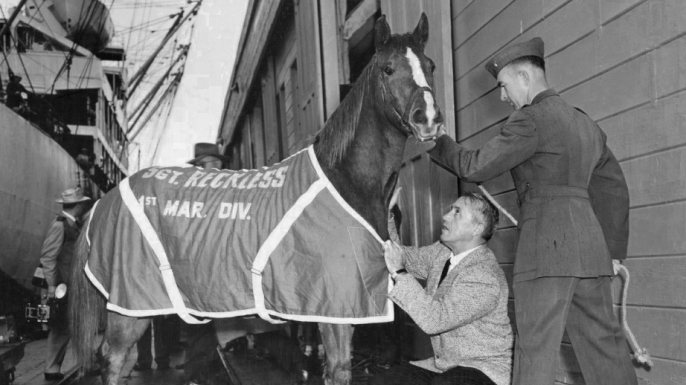 Reckless: America’s War Horse. After Allied forces defeated Germany in World War II, Europe became a difficult place to be associated with Adolph Hitler’s Third Reich. Thousands of Nazi officers, high-ranking party members and collaborators—including many notorious war criminals—escaped across the Atlantic, finding refuge in South America, particularly in Argentina, Chile and Brazil. Argentina, for one, was already home to hundreds of thousands of German immigrants and had maintained close ties to Germany during the war. 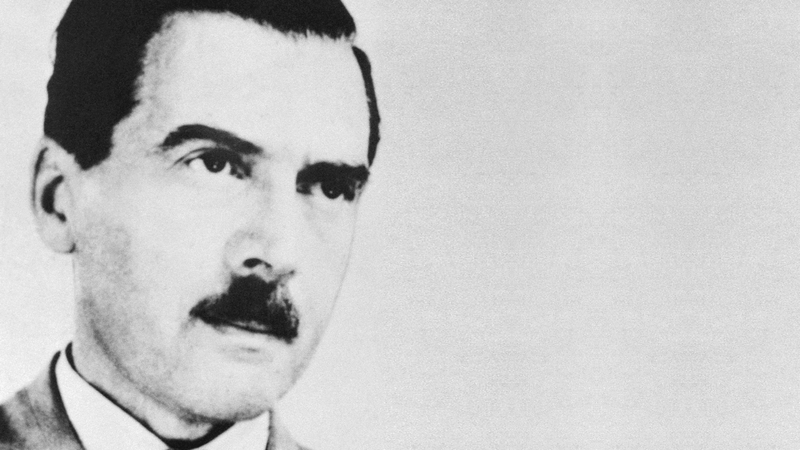 After 1945, Argentine President Juan Perón, himself drawn to fascist ideologies, enlisted intelligence officers and diplomats to help establish “rat lines,” or escape routes via Spanish and Italian ports, for many in the Third Reich. Also giving aid: the Vatican in Rome, which in seeking to help Catholic war refugees also facilitated fleeing Nazis—sometimes knowingly, sometimes not. As thousands of Nazis and their collaborators poured into the continent, a sympathetic and sophisticated network developed, easing the transition for those who came after. While no definitive evidence exists that Hitler himself escaped his doomsday bunker and crossed the ocean, such a network could have helped make it possible. Below, a list of some of the most notorious Nazi war criminals who made their way to South America. WHAT HE’S INFAMOUS FOR: The “world’s most wanted Nazi,” Eichmann was the architect of Hitler’s “Final Solution” to exterminate the Jews from Europe. The notorious SS lieutenant colonel masterminded the Nazi network of death camps that resulted in the murder of approximately 6 million people. Eichmann orchestrated the identification, assembly and transportation of European Jews to Auschwitz, Treblinka and other death camps in German-occupied Poland. HIS PATH TO SOUTH AMERICA: After World War II ended, Eichmann went into hiding in Austria. With the aid of a Franciscan monk in Genoa, Italy, he obtained an Argentine visa and signed an application for a falsified Red Cross passport. In 1950 he boarded a steamship to Buenos Aires under the alias Ricardo Klement. Eichmann lived with his wife and four children in a middle-class Buenos Aires suburb and worked in a Mercedes-Benz automotive plant. The passage of the Kansas-Nebraska act drove many northerners to form Anti-Nebraska coalitions that ultimately yielded the Republican Party. The election of 1856 did not yield a Republican presidential victory, but it did produce a party that, through compromise and political maneuvering, was able to emerge as the dominant new party to compete with the bitterly divided Democrats.